Tagline: "Power built an empire. Passion destroyed it." Released a year after The Godfather, The Don is Dead is yet another movie that throws the spotlight on organized crime. But unlike Coppola’s award-winning epic, this 1973 film takes a “down-and-dirty” approach to the material, telling the story of a bloody mob war fought not for money or power, but for love. The trouble begins when Don Paolo, the head of the Regalbuto crime family, dies unexpectedly. As a result of his passing, the Regalbuto empire is split in half, with Don Angelo DiMorra (Anthony Quinn) assuming control of one part and Luigi Orlando (Charles Cioffi), the consigliere for the imprisoned Don Jimmy Bernardo (Barry Russo), taking over the other. With no heir of his own, Don DiMorra also agrees to take Don Regalbuto’s son Frank (Robert Forster), under his wing, promising Frank that he will one day inherit the DiMorra crime family and all of its assets. But Luigi Orlando has plans of his own, and together with Jimmy Bernardo’s girlfriend Marie (Jo Anne Meredith) he attempts to drive a wedge between Don DiMorra and Frank by setting DiMorra up with Frank’s girlfriend, a singer named Ruby (Angel Tompkins). Not realizing that Frank has been seeing Ruby on a regular basis, Don DiMorra falls in love with her, causing a surprised Frank to lose his temper when he learns of the affair. Before long, the two former friends are engaged in an all-out war, with Don DiMorra and his family on one side, and Frank and his pals the Fargo brothers, Tony (Frederic Forrest) and Vince (Al Lettieri) on the other. Both Frank and DiMorra suffer major losses as the war rages on, while Luigi Orlando sits back, waiting patiently for the perfect moment to swoop in and take control of the city. But when the smoke finally clears, will it be Orlando who comes out on top, or someone else entirely? 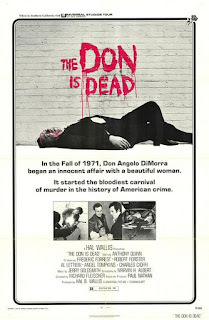 The cast that director Richard Fleischer and his team assembled for The Don is Dead is certainly impressive; Anthony Quinn, Frederic Forrest, and Robert Forster deliver top-notch performances, as do a pair of Godfather veterans, Al Lettieri (as one half the Fargo brothers) and Abe Vigoda (who appears briefly as Don Talusso). Yet what makes The Don is Dead such a treat is the manner in which screenwriter Marvin H. Albert (who also penned the novel the movie is based on) structures the story, hitting us time and again with shocking violence while also taking us behind-the-scenes, where we watch as the two sides use strategy and deception to try and gain the upper hand. And like most stories that involve a war, we’re never sure at any point who is going to be the next person to die. While it doesn’t quite reach the same lofty heights as The Godfather, The Don is Dead is nonetheless an entertaining crime film, and it packs a fair number of surprises into its 115 minutes.